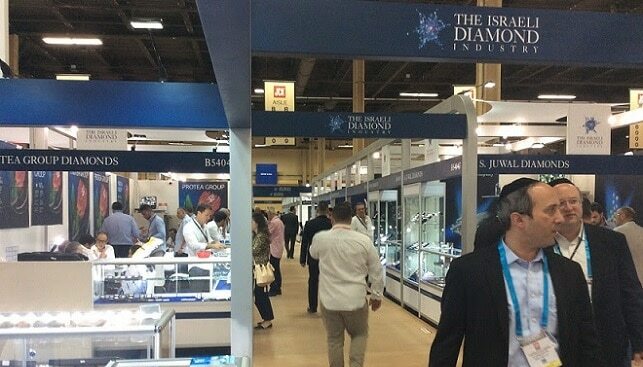 The Israeli Diamond Industry will again be among the largest international exhibitors at the JCK Las Vegas show (June 1-4, 2018,) the most important trade show in Israel’s number one export market. The Israel Diamond Pavilion, organized by the Israel Diamond Institute (IDI) will feature 34 exhibitors, according to a press release. This year, however, IDI is planning something new: the Israel Diamond Pavilion will hold a diamond auction, featuring special stones offered by Israeli exhibitors at very attractive prices. The goods will be on view at the pavilion and bids accepted from June 1 – 3. Progress on the bidding will be shown on screens located within the pavilion. The Israel Diamond Pavilion, at the heart of the Diamond Plaza, will offer a Lounge where refreshments will be served throughout the day. Get Diamonds, which enables buyers to search for goods among Israeli exhibitors, will have a dedicated terminal at the Lounge. The popular search engine is also accessible on smartphones. IDI will also launch a dedicated website for the JCK show with a map of the Israel Diamond Pavilion, full details about the Israeli exhibitors and the stock they will exhibit at the show. The site will go live a day before the show opens. IDI Chairman Boaz Moldawsky said: “We are looking forward to a very good show this year at JCK Las Vegas. There is a growing demand from our U.S. clients and that is very encouraging. The United States is our largest market for polished diamonds and we are optimistic that we will continue to lead in this market,” he said. The US accounts for about 40% of Israel’s polished diamond exports. In 2017, Israel’s net polished diamond exports to the US stood at $1.7 billion out of a total of $4.5 billion.